Important! OneLogin's Workday Real-time integration is in limited release. To try it out, please contact OneLogin Support. This article tells you how to configure the integration, but it requires significant Workday administration expertise. If you don't have that expertise, we recommend that you engage a Workday consultant to help. To provide OneLogin with real-time updates when employees are terminated in Workday, you can add a OneLogin integration system as a step in your Workday employee termination business process. After you do, OneLogin will instantly suspend users from application access as soon as their termination is complete in Workday. This real-time integration provides updates to OneLogin only upon employee termination. It works in conjunction with either the Workday Bidirectional directory connector or the Workday Custom Reports directory connector, which synchronize all other updates to OneLogin from Workday every 6 hours by default. Workday's real-time integration with OneLogin is included as a step in the your Workday Termination business process and uses the Workday REST API to send the termination event to OneLogin. Transactions are entered into Workday using either the Workday user interface or from an external system using the Workday API. The business process associated with the transactions is triggered and routes for all necessary approvals. 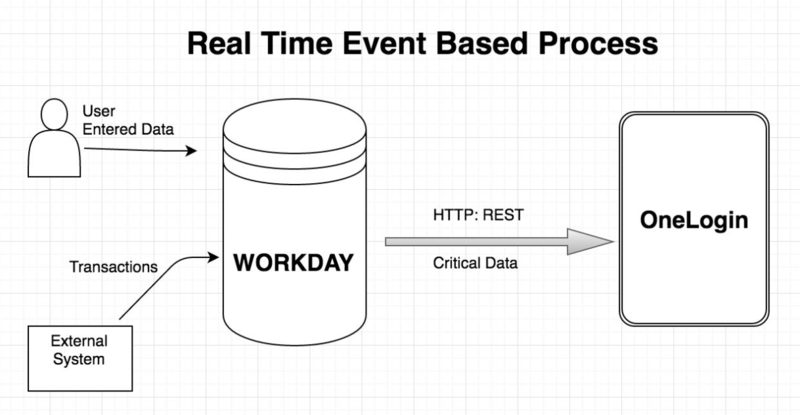 When the business process is complete, it triggers the Workday-to-OneLogin integration, which sends the required event data to OneLogin using a REST call. Get an API credential pair (Client Secret and Client ID). Create credentials with a minimum scope of Manage users. See "Working with API Credentials" at developers.onelogin.com. You can use either the Workday Bidirectional directory connector or the Workday Custom Reports directory connector. In either case, your directory attribute mapping must map worker_id to OneLogin externalid. This is the default configuration for both connectors. 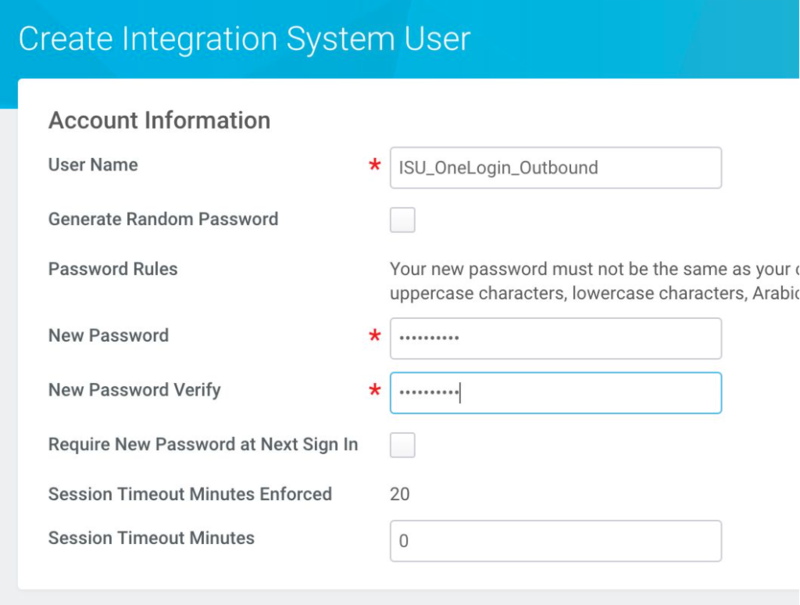 All Workday integrations, like the integration with OneLogin, require a separate Integration System User account with access to all of the Workday security domains touched by the integration. If you want to export real-time updates from OneLogin to Workday, you must create an Integration System User account with Put access for all of your Workday domains that can be exported from OneLogin to Workday. Create the Integration System User that will be used by Workday to post data to OneLogin. Create the user, entering the following Integration System User details. Make the integration system user exempt from password expiration. Search for and open the Maintain Password Rules task. Add the Integration System User to the System Users exempt from password expiration field. Assign the Integration System User to a security group. Name the security group "ISG OneLogin"
Add the Integration System User you created above (ISU_OneLogin_Outbound) to the group and save the configuration. You must search for each domain, select it, click the Actions button, and select Domain > Edit Security Policy Permissions. Under Integration Permissions, add the Security Group that you just created (ISG OneLogin), select the Put checkbox, and click OK.
OneLogin has created an Integration System that you must download, import, configure, and add to the termination business process in Workday. Import the file to Workday as an Integration System. Search for and select the Integation System OneLogin_Workday_Integration. Add the Integration System User to the Integration System. Click the Actions button and select Workday Account > Edit. Add your OneLogin API credentials (Client ID and Client Secret). You should have gotten these when you fulfilled the Prerequisites. Click the Actions button and select Integration System > Configure Integration Attributes. Under OneLoginAttributes, find client_id and client_secret, and add the values in the Value column. Add the Integration System to the Termination Business Process. In this example, we add it to the Termination (Default Definition) Business Process. Search for Business Process: Termination. Click the Actions button and select Business Process > Edit Definition. Add a new step to the business process, inserting it after the completion step. Select a step type of Integration and click OK.
Click the Configure Integration System button.